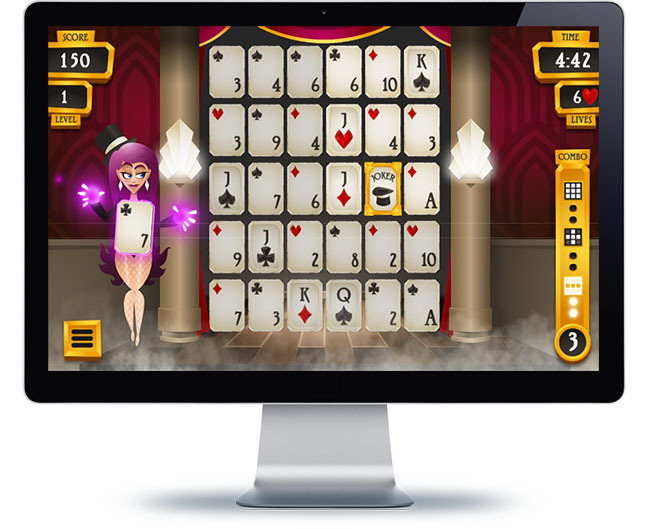 In this magic show themed version of Solitaire, the illustrious Selina needs your help, as her assistant, to make magic by placing all of the cards correctly. In order to impress the audience and give the best performance of your life, your goal is to match cards that are one higher or lower in value. As soon as you match a card correctly, it will disappear.You can also wow the audience even more by making longer combinations of matches, which will make more cards disappear at once and allow you to receive extra points! Choose any card at the beginning of the game and then match it with a card in the game field that is one higher or lower in value. The higher your matching combo is, the more cards will disappear at once when you remove a card. In order to help you out, you can also combine the Joker with any other card.